As competition remains fierce, standing out from the crowd is key. The level of competition for securing a dietetics internship is fierce. In fact, according to the Accreditation Council for Education in Nutrition and Dietetics, the industrywide acceptance rate is only 50%. With odds like that, anything students can do to differentiate themselves from their peers is critical. 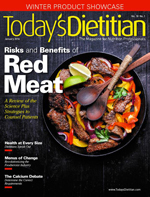 Today's Dietitian recently caught up with three dietitians who spoke on this very topic at the Academy of Nutrition and Dietetics' Food & Nutrition Conference & Expo®. In their presentation, "Set Yourself Up to Earn the Internship," they shared valuable ways students can stand out from the crowd. And in this article, they share some of those same pointers. If students really want to be outstanding, according to Debra Wein, MS, RDN, LDN, the program director at Wellness Workdays, which offers an internship with a worksite wellness concentration, they shouldn't wait until the application process begins. There are plenty of opportunities to show interest in a program before even filing an application. "Prior to submitting your application, contact the internship staff to introduce yourself, give a summary of your skills, and explain your interest in the internship program," Wein says. "Another great opportunity to meet the staff is to attend open houses and show active participation in the event. Remember to be professional with all interactions—phone, e-mail, and in person. Lastly, send thank-you notes by snail mail or e-mail. This helps keep your name in mind come application review time and demonstrates your professionalism." When internship directors are reviewing candidates' applications, they're definitely seeking out a well-rounded individual, adds Alexis Fissinger, RDN, a nutrition fellow at NewYork-Presbyterian Hospital, who recently went through the internship process herself. It's not just GPA or even clinical experience that counts. "I think there's this misconception that they're looking for candidates that already have a lot of clinical experience," Fissinger says. "In reality, internship directors are looking for someone with a variety of experience. If you have held a leadership role or been involved in a special project, you might bring unique skills and value to the job." Gina Pazzaglia, PhD, RDN, didactic program director of the department of nutrition at West Chester University of Pennsylvania, agrees that "transferable skills" are incredibly important. "Students should be able to take experiences they've had—such as a position where they played the role of a mentor, leader, or educator—and then explain how it applies to the internship they're going after," Pazzaglia explains. "Directors appreciate personal stories. And they appreciate your ability to explain how you learned from a certain situation or role you were in." With so many résumés being sent in for each internship opportunity, the idea of standing out from the crowd can be overwhelming. First and foremost, Pazzaglia says that résumés and personal statements should be grammatically accurate. Grammatical errors are one of the easiest ways to have your application overlooked right off the bat. "The personal statement and résumé should be grammatically impeccable," Pazzaglia says. "That's just a simple way to show that you actually care about your work and the position you're going after. Have many sets of eyes on it before ever turning it in. You should also take advantage of your school's career and/or writing center for reviewing the résumé and personal statement." Fissinger says she reached out to peers and mentors she trusted, asking them to review her personal statement and provide feedback. "The personal statement can feel awkward to write," she says. "It may feel like you're bragging about yourself, which can be really hard to do. Getting support is incredibly helpful. Ask a mentor what they feel are your stand-out attributes." Pazzaglia adds that showing both strengths and weaknesses in the personal statement is important. But use weaknesses to discuss personal growth. "In discussing weaknesses, talk about how they've turned into areas of growth," Pazzaglia says. "For example, you can say that you began your academic career without a lot of organizational skills, but over the past four years you have learned both time management and organization in order to succeed. Always demonstrate how you're working on improving weaknesses." Students who make it as far as the interview may feel like the pressure is on. But this is the place to shine. Students who have made it this far have had their opportunity to show why they deserve the position—and they should be as prepared as possible. Wein stresses the absolute importance of "practice" before the actual interview. This may be done with a family member or peer—or even through their school's career office. Practicing interviewing skills ahead of time increases confidence. "For each position that you interview for, think about some of the questions they may ask you," Wein suggests. "Prepare answers for these questions prior to the interview. Utilize examples from past experiences that help to demonstrate your ability to be successful at the job." Fissinger agrees that reflecting on possible interview questions and responses is a great way to prepare. "In addition to thinking about experiences you've had, think about some of your own personal qualities that might lend themselves well to the field," Fissinger says. "For example, if you have a warm personality, are empathetic, are a team player, or an effective communicator, all of those things would lend themselves very well to being a dietetics intern. Be prepared to explain how not only your skills and experiences but also your personality make you a good fit for the role." Wein also suggests asking who will be conducting the interview to better prepare for the experience. "When I interviewed for my first job out of graduate school, it was with six interviewers. Having six people firing questions at me for an hour is a lot different than a one-on-one interview," Wein recalls. "I got the job, but it would have been nice to prepare myself for that prior to going in. Ask about job titles so you know who will be in the room and how to direct your answers to the right people." When the day of the interview comes, Wein says it's important to "dress the part, arrive early, and bring a copy of your résumé. "During the interview, be calm and confident," Wein adds. "Getting the interview is often the harder part. The interviewers already like you on paper, so the next part is just to have them like you in person. Be confident in your skills and your ability to learn and perform on the job. That will show the interviewer or interviewers that you are the right fit." While the task may seem daunting, the payoff will be worth all the effort. Fissinger has a few final words for students, once they do receive that coveted internship. "Remember that the internship experience really is once-in-a-lifetime," she says. "It's a time when you're going to learn so much about yourself and your career goals. Take that time to ask questions and get as involved as you can. As an intern, I learned that being positive, curious, and flexible are three invaluable skills. But in the end, the experience is what you make of it."